Hello, my name is Ruth and I am 61 years old and live in Carmarthen, West Wales. In spring 1999 my husband died suddenly, leaving me with 2 grown up children. At first I had no thought of remarrying, but a lady from a local church said that she felt I would. Late in 2000 I joined a Christian introduction agency and stayed with them for a number of years and went on a number of holidays with them. I joined other agencies for short periods, including friendsfirst in its earlier days, but never found Mr Right. I wondered if there would ever be one and how long I should carry on looking, or whether I should accept singleness for the rest of my life. friendsfirst didn’t give up on me, though, and contacted me from time to time, hoping I might rejoin. At last I terminated my membership with the other organisation, and when friendsfirst started its postcard campaign, giving a snapshot of how members had met and married, I decided to do so and asked for the maximum number of profiles a year, to make the most of my opportunities! My first profiles were sent to me in September 2007 and at the top of my list was Clive from Neath, about 32 miles away, so I decided to write to him, although he said he wasn’t a pet lover, and my daughter and I have 3 cats! Our letters crossed in the post, which was quite encouraging and we started writing regularly and then phoning. We met for the first time in late November and agreed that it should be a short meeting, in case we didn’t get on. We went for a walk and then for a coffee and felt very comfortable with each other. The following time we met we were together all day and just seemed to be right together. Amazingly he’d never been married, even though he was a kind, gentle person and very good looking (something I hadn’t even asked for!) From the beginning I felt free to tell him about my personal circumstances, including my daughter, who lives with me. From the first time she met him my daughter thought he was a lovely person, and they got on well together. My friends and family all like him too and he fits in well. We went to meet the family at the beginning of May and on 31st we became engaged, and put our houses on the market. Because the housing situation is poor at the moment we’ve set our wedding for 20th September, so there’s no need to delay being together and he’ll move into my home. As soon as something starts moving we’ll buy our new home. My daughter will be my bridesmaid and my son will be giving me away. It’s been truly wonderful how the Lord has led us. We praise him for all that is past and trust him for all that’s to come. My testimony is that ‘I, being in the way, the Lord led me’. He has brought us together, and we want him to be in the centre of our lives together. Than you, Lord, and thank you, friendsfirst! To some it might have been seen as being ‘one last throw of the dice’! … a matter of giving it one final go; but it became clear that God had other plans. I had always longed for Christian companionship, for that special relationship; yet equally wanted to be prepared to remain single if that truly was God’s will for me. Thus it was that over a number of years I had had intermittent contact with several Christian introductory agencies; perhaps generally approaching things somewhat half-heartedly, without any great expectations and had all but given up. Even though a year with friendsfirst had brought about a ‘friendship’ relationship with a very dear Christian widow, the distance we needed to travel in order to meet up eventually caused us to decide that our relationship was not really viable. Mutually we parted, but in friendship. For me that was ‘end of story’ but God, through Wayne (membership secretary), had other ideas. Wayne’s phone calls and interest persuaded me to rejoin for one more year. This I did at bronze level requesting profiles just twice a year. I continued to pray about things, but did not receive the first batch of profiles very enthusiastically! A key factor, however, was help from the ‘Top Tips’ guide together with Wayne’s encouragement to me to be evermore proactive! As Ruth indicated in her testimony, the Lord gave us a desire toward one another in Him; confirming this by the way in which He enabled us to feel so ‘comfortable’ in the many aspects of our developing relationship. What I have to ask beside? … For I know what e’er befall me, Jesus do-eth all things well. And as the 3rd and 5th verses stress, ‘trust’ and ‘commitment’ are key components of that! We praise Him for bringing us together; we delight in the relationship He has given us; we trust Him for all that is yet to be; we commit ourselves to Him together … and thank friendsfirst for being the catalyst enabling our friendship to develop into a relationship leading us to marriage! 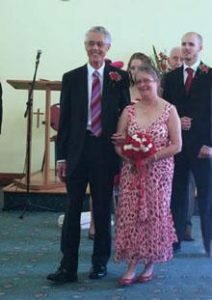 P.S As promised, I attach a photo of my wonderful wedding & marriage to Clive. This was followed by a trip to Scotland. The weather for both was unimaginably wonderful. Thank you for bringing us together. The people behind us are Clare & Richard, my children, & my dad. Thank you again so much & may the Lord bless your wonderful work. Without it we don’t think we would ever have met, because we moved in different Christian circles, even though living comparatively close.